Automotive and other manufacturers have been investigating processes which reduce weight in their product, save material costs, speed production procedures, and still allow use of existing production stamping presses. 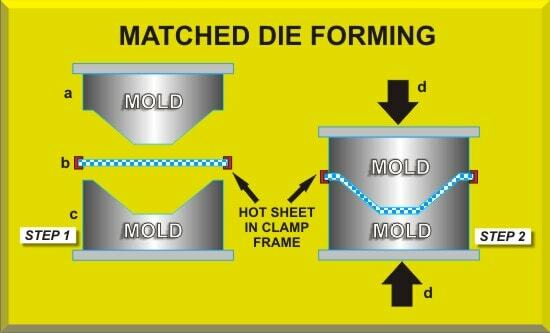 After months of development, HF K & K Tool & Die Company received a patent in May 1999 on our process called “Liquid Impact Tool Forming Mold,” or LIF. This process, which is similar to “hydro-forming,” is applicable to tubular parts. In addition to the advantages of weight reduction and material savings, LIF also allows normal stamping press cycle times, eliminates spot welding, reduces scrap, produces parts with more integrity, and promotes less total parts in an assembly. This patented process has also been proven to hold tighter tolerances than traditional metal stamping dies. 1, Requires only a production metal stamping press. 2, Production rate of parts from LIF dies are approximately 200-300 parts per hour. 3, All LIF pressures and forming components are contained within the die. 4, LIF dies can be in transfer with other stamping dies. 5, Parts with spot weld flanges can be produced in LIF dies.